Senior Kyle Wolfe smiles while strolling through the halls and saying goodbye to classmates. The walk symbolizes the passing of the torch from the class of 2018 to the class of 2019. On May 11, 2018, the senior class walked the halls of North one last time before graduation on May 15. The long-standing tradition at North gives the seniors a chance to say goodbye to students and staff, while remembering the last four years. “After seeing previous seniors walk, it was finally my turn, and it was bittersweet,” said senior Helaina Stone. While it’s exciting that students are starting a brand new chapter and moving on from high school and the comfort of childhood, some friends find it difficult to let friends go. “I started crying before any music started playing and any seniors starting walking. I was hysterical. Everyone is leaving me,” said junior Cecelia Wagner. As they graduate, North reflects on the impact the class of 2018 left on the community. “There were many stellar people who had a commitment to the community and inspired me everyday with a spirit of philanthropy,” said English teacher Megan McCorkle. The students left their mark on the school with various accomplishments in art, athletics, academics, and character. However, many graduates credit others here for helping them make it to this milestone. “I didn’t really impact PNH, but it impacted me in a huge way. The teachers helped me when I was a mess and helped me get my life together,” said Stone. The walk symbolizes the end of one grade’s journey through North and the start of a new leadership. The junior class looks ahead to being the top next year. “I can’t believe I’m already going to be a senior. 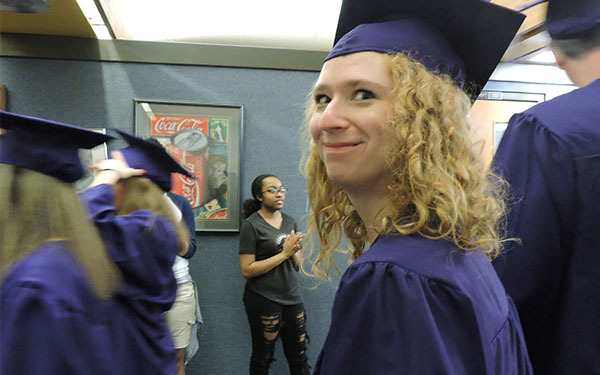 My senior walk is in one year, and I am 100 percent sure I will cry harder next year because my classmates will be dispersed across the country,” said Wagner. Though their time at North is up, the community will remember the various personalities and achievements of the class of 2018.